Love it or hate it episode VII The Force Awakens was one of the most anticipated movies over the last thirty years or so. Although many people thought it was a partial remake of the original Episode IV it came with a lot of new characters and a few new mysteries. One of those is the true origin of Snoke the Supreme leader of the First Order. This information comes from someone who worked on episode VII and has seen the deleted scene which involved Snoke talking to Kylo Ren about his past. Snoke is an eight foot tall Sith who is closest thing the Dark Side have to Yoda, in fact Snoke is a few thousand years old, he uses the Force to keep his weathered old body alive and cheat death. You might notice in The Force Awakens and Rogue One we see a lot of new locations and with most of them there are ancient temples and statues, these set the scene for a much bigger story which could unearth the origin of the Force itself. Even Luke has been living in an ancient template to look for clues about the ancient Dark Side and Jedi origin. 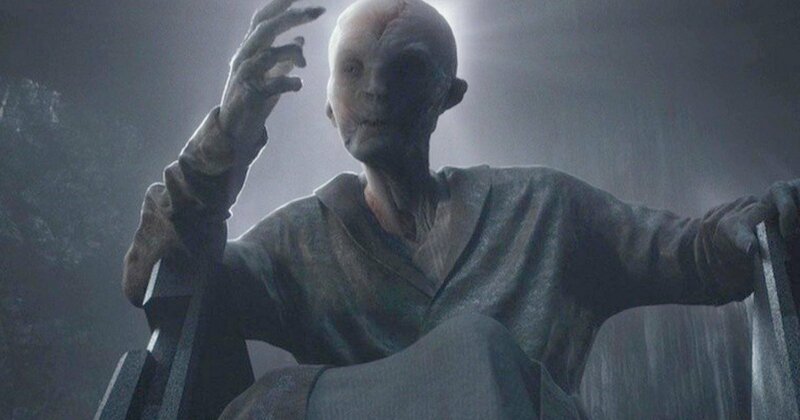 In the deleted scene Snoke explains to Ren that he is thousands of years old and he has seen the rise and fall of the Jedi, in fact they are just a blip in the full history of the dark side. “Snoke was a humanoid alien who witnessed the rise and eventual fall of the Galactic Empire” – The Force Awakens Novel which has a partial remnant of the deleted scene. In the later cuts of the movie the scene was removed to leave a little mystery and to give us something to look forward to in Episode VIII. So far we have seen Snoke in hologram form which was animated using motion capture work thanks to Andy Serkis. In Episode VIII we will see him walk in the flesh and the studio are experimenting with bringing him to life with animatronics for a more realistic effect which wont age as badly as CGI tends to. The origin of Snoke will open up the Star Wars mythology to a much larger universe as it will span thousands of years too. It also raises the stakes in terms of a threat, we’ve already seen the Jedi defeat a Sith Master, now its time for them to face off against the oldest and mightiest Dark Side master of them all. Kind of like all the other Sith lords are vampires and Snoke their Dracula, the source, the origin, the strongest of them all.